We sold this truss dock system to the Douglaston Club in New York City. Robert was in charge of putting the dock together and launching it for the use of club members. The dock system comprised of two 8×24’ truss docks (bolted together into a 16×24’. 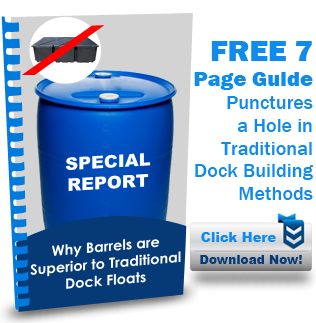 The system used a total of 32 barrels and allowed 384 square feet of dock space. The dock was installed on the Long Island Sound making our ABYC saltwater approved design critical to this application. Robert assembled the kits on a small basketball court, taking advantage of the level ground to help the pre-drilled holes line up. When the docks were fully assembled, he loaded them onto a tow truck and launched them onto the sound. He bolted the docks together on the water and anchored it to the sea floor. This dock system also took advantage of our ability to issue a Boat Certificate of Origin to allow the dock to be legally registered as a boat. This can save on dock permitting costs or even allow you to install a dock in a location that typically do not allow them.